Whole grains are the foundation of a healthy diet, but unfortunately are lacking in many of our kitchens today. In fact, according to a 2015 survey by the Whole Grains Council, only 31 percent of Americans always choose whole grains over unhealthy refined grain products. So what’s the fuss about, anyway? Unlike stripped down refined grains, whole grains maintain the entire grain kernel – bran and germ included – and are packed with fiber, vitamins, healthy fats antioxidants, and minerals like iron and zinc. This means that your everyday refined grains like “wheat bread” or packaged crackers aren’t the real deal. The consequence? The starch is quickly converted to glucose, leading to blood sugar level spikes and sugar cravings (the last thing you want for your littles). Clearly, we’ve got a whole lot of love for whole grains, and we want to share the love with you! 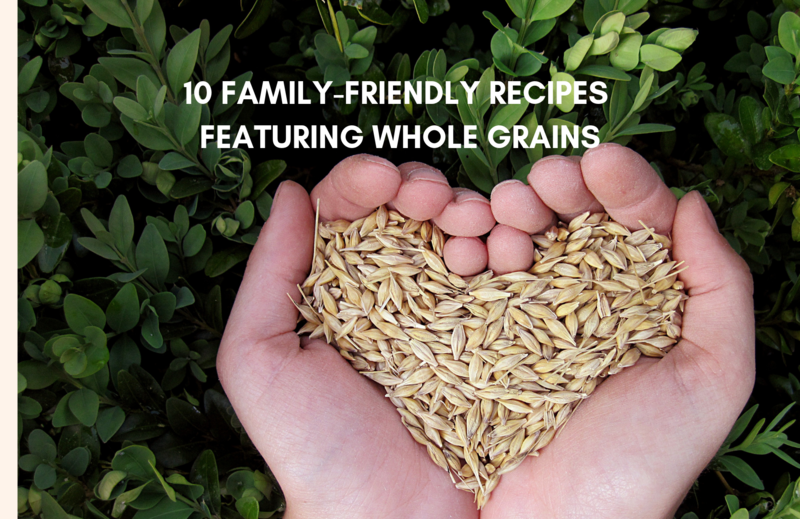 That’s why we’ve put together a collection of delicious, kid-friendly recipes that encourage your family to incorporate more whole grains into your meals. Think: brown rice, whole rolled oats, and quinoa. These recipes easy to make, fun for kids and super nutritious! Win, win, win. Skip the pre-packaged oatmeal for a delicious, inexpensive homemade option prepared in a mason jar in a few minutes! Feel free to modify the flavor by changing up the add-ins with what you have on hand. Made with mini sweet peppers, these little guys get the stamp of approval from kids and parents alike. They’re stuffed with veggies, brown rice and cheese, making for a nutrient-rich, hearty appetizer or fun weeknight meal. Healthy up this childhood favorite with simple, plant-based ingredients like rolled oats, almond butter and chia seeds. Perfect for a lunchbox treat or on-the-go snack! Filled with protein and fiber, quinoa is the superstar in this savory recipe, great for fall or winter! We love that it also packs in veggies like broccoli and of course, squash. Finally, muffins that aren’t loaded with sugar but taste amazing! Made with butternut squash, gluten free oats and hemp seeds, these babies are perfect for little hands and loaded with protein and healthy fat. This easy one-pan meal has it all – veggies, protein, and healthy fats – making it a total win in our book. This is a family favorite for cozy weekend mornings! Try cutting the honey down to 1/4c., or swapping out pecans for a mix of hemp and chia seeds for an added superfood boost. Healthy up your spaghetti night, with these 6-ingredient meatballs, using cooked quinoa as a delicious and nutritious binder! These vegan pancakes ditch the traditional white flour, replacing it with nutrient-rich nutty buckwheat (which is actually gluten free and considered a pseudo-grain – sort of a grain but sort of a seed too). Top with raspberries for an extra antioxidant boost and vibrant color! Made with just four ingredients, these cheesy vegetarian rice cakes put leftover brown rice to good use, and are a hit with the whole family.